They keep saying to establish structure in the home but what does that mean? We have a routine and schedule …what structure are they talking about? 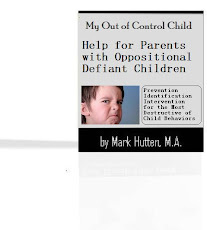 Oppositional defiant kids need structure and moms and dads need to provide it. It's amazing to me the number of moms and dads who give their kids an allowance without demanding anything in return from their kids. I always suggest that moms and dads set up a behavior chart providing their kids with responsibilities. I have the moms and dads put a monetary value on each daily item on the chart. At first, I suggest that the chart be rather short. I have the moms and dads and youngster focus on 4 or 5 areas that need improvement. Each night after dinner, I suggest that the moms and dads review the chart with their youngster. Areas accomplished successfully should be checked off on the chart and rewarded with tokens. At the end of the week, assuming the youngster has accomplished some tasks, he will get his allowance based upon tasks completed. If the youngster saves the money, I recommend the moms and dads provide their youngster with a 10% monetary bonus. If a youngster displays negative behavior such as prolonged temper tantrums, disrespect toward others or fits of anger, negative consequences should be implemented. For negative consequences, focus on items that your youngster values the most and remove privileges for a reasonable amount of time. Kids are not usually amenable to being lectured, given moral injunctions, or being coerced into handling responsibilities. A critical issue with parenting is creating a sense of involvement. In this era, a parent must have established a positive relationship with a youngster before being able to promote understanding of the responsibilities the youngster must accomplish. A style of relating based upon mutual respect, encouragement and coaching is essential. Moms and dads need to listen to their kids and give them feedback about different ways of viewing problems and issues. It is important as a parent that you are consistent in administering a behavioral consequence system. If you can't be consistent, then don't implement a system. It is important that you use the behavioral consequence system as a way of removing yourself from power struggles with your kids. Moms and dads make a major mistake in over explaining themselves to their kids. If you have a rule or consequence, it needs to be enforced, not explained. Moms and dads who try to justify their rules to their kids weaken their parental role. Moms and dads somehow believe that their kids will not love them if they assert themselves with guidelines for behavior. This is nonsense. Love has nothing to do with it. Kids do not respect a parent who does not set up appropriate boundaries for their conduct. Providing behavioral structure for your kids is a combination of building respect, establishing rules for behavior and developing responsibility in kids. 1. A defiant and rebellious youngster needs structure. In the beginning of the day, let them know what the schedule is for the day and stick to it as much as possible. When they know what to expect, they know what you expect and it is easier for them to comply. 2. Choose your battles! Know your youngster and know what things drive them. Don't feel like if you let them get away with this or that that they'll feel like they can get away with everything. They really won't and they will look forward to doing the things that they weren't allowed to do last week as long as it is not destructive or hurting anyone of course. Sometimes as moms and dads, we have to learn to let go a little in order to have a little peace and let your youngster grow up a bit. 3. Do not argue or fight with your youngster. Do not stoop to their level. You are the parent! You are the mature one and need to keep your cool. I KNOW it's sooo hard. I've been there and still going through but I also know what works from much experience. I've read all the books on dealing with defiant kids and the example of kids in those books do not even hold a candle to my youngster. 4. Engage in some positive activities with your youngster for at least 30 minutes a day. Start forming a positive relationship of love and respect with your youngster. If they like to draw, draw with them and compliment their work. If they like to play sport, pitch some baseballs to them or shoot some hoops and encourage them with words of affirmation. If they like to play house, you be the youngster and let them be the parent (it can be very funny and a lot of Fun). Whatever it is that they like to do or are good at, do it with them and compliment and affirm them. This will show your youngster that you are interested in who they are and what they like. 5. Have a fabulous rewards system. Whether it's a daily thing or you put up a sticker chart. Have something that the youngster can see that displays how well they are behaving and let them know what the rewards are for good behavior. Rewards can be taking them to the corner store to pick out a snack, to a new toy or a trip to the Zoo. 6. Let your youngster engage in activities with you. Whether it’s raking the lawn, making dinner, or folding the laundry, let them engage with you. 7. Most defiant and rebellious kids have a problem with wanting attention. You may think that they get most of your attention because you are on them all the time for their poor behavior but the truth is, is that is what they want and need if they are ever going to change. 8. Take an evaluation of your youngster. When he/she has an episode of defiance or rebellion, are there any typical events that surround those situations? Did your youngster get a good night’s sleep? Did he/she eat a certain type of food i.e., sugar, food with red dye, caffeine? Did he/she get left out in a group of friends? Did they spend some time at a friend or relatives house recently? Try and think of the events that lead up to this behavior, write it down and see if you can make any connections. Once you have taken the evaluation, make any adjustments that you think might help. It may be taking a certain food out of the home. Maybe getting them to bed earlier or giving them a nap. Maybe not allowing them to play with a certain friend. It maybe not giving them their Flintstone vitamin or cutting off the caffeine or sugar. It also may be not allowing them to watch a certain show on TV or playing a particular video game. VERY IMPORTANT... change will NOT happen overnight. Once you make an adjustment, stick with for at least 2 weeks to see the effects of it. DO NOT GIVE IN no matter what. 9. Try to adjust your discipline techniques. Instead of spankings, take a toy away, don't let them watch TV, or make them do a household chore. Try time outs in a different way. Don't stick them in their room. Try putting them in a corner, facing the corner and stand there the whole time that they need to be there. If your youngster is defiant, they most assuredly will not just stand there if you just tell them to. You need to be there the whole time to enforce it. KEEP AT IT. DO NOT GIVE UP. Even if it takes you 45 minutes to stand there, facing the corner for 5, do it until it's completed. Show them that you will not back down and that you are the one in charge and in control. I've found that with defiant kids, they do not respond to spankings. I would use that as a last resort if you are a spanker ... but if you're reading this article, I just have to ask... "How's that workin’ for ya?"